The Spotted Sandpipers is a freshwater breeder are found across most of the United States and Canada. Spotted Sandpipers are not social birds and are seldom seen in flocks. Pete Dunne’s “Essential Field Guide Companion” states that they migrate in flocks of fewer than a dozen individuals. I’ve watched their teetering accelerate when they’re unsettled and nearly stop when they’re content. When they forage, they’re recognized by the endless nodding and teetering. They are visual feeders and can catch a flying insect. It’s the Spotted Sandpipers’ life history that interests me. 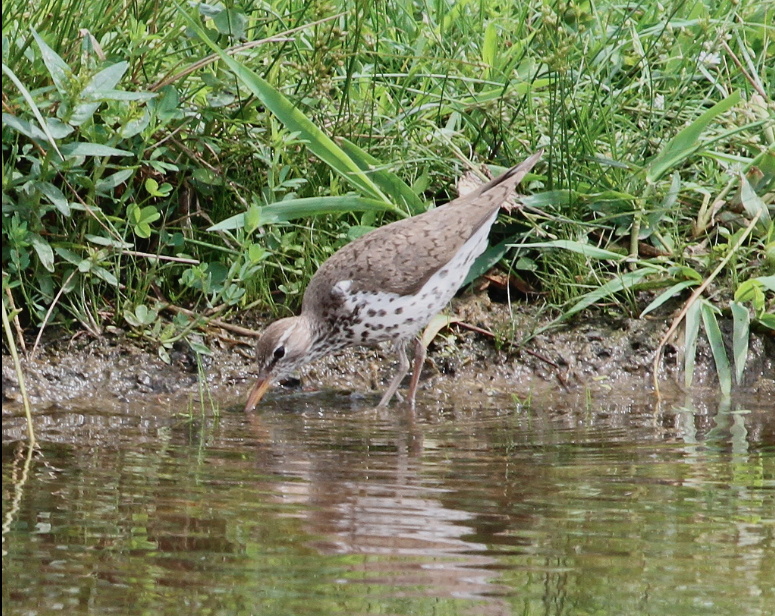 The Spotted Sandpiper females are nearly 25% larger than males. Spotted Sandpipers are ground nesters. Females may copulate with up to 5 mates, but they leave the job of incubation and chick rearing to the males. Males incubate a maximum of 4 eggs for up to three weeks, and the young fledge in 17-21 days. By having multiple mates, a female is able to boost her reproductive efforts. The female may store seminal fluid for nearly a month. That means that the eggs she lays for one male may be sired by another from a previous mating. The male provides the parental care, and it is possible that those young have none of his genetic material. Ehrlich, Dobkin and Wheye’s text states “Spotted Sandpipers thus forgo the advantages of having two parents to care for eggs and chicks. At least in the study population, however, that does not seem to affect the fledging rate greatly, and the Spotted Sandpipers’ reproductive strategy seems to be highly successful.” The text also says that Spotted Sandpipers breed at an early age, live a relatively short time (breeding females live an average of only 3.7 years). The season’s insects hatch out to nourish them, and the days shorten; fall migration begins in July. I’ll be watching for the females, the nurturing males and this season’s fledglings as they linger to forage for insects and aquatic invertebrates along many shores, building their fat stores to fuel their journey to Chile, Argentina or Uruguay.